In 2008, I was talking to a friend who wanted to set up Teppayaki, but was disappointed with the Chennai market. He said it will take Chennai a very long time before Chennaites embrace new concepts. I think that 'long time' has arrived! Either new age restauranteurs are taking risks and pushing new concepts or people are open. OK, who cares if the egg came first or chicken came first! We have both now! I like the fact that they have tweaked the fondues to include a slightly spicier and flavourful fondue while also retaining the classic Swiss fondues. The cup sized portion is also a welcome change and the only thing the cup takes away is the crisp layer of cheese that settles in classic fondues that people tend to love to scrape and eat. No such thing here. I loved the things you get to dip in the cheese. Unlike the classics where you get typically just bread cubes and potatoes, here you have some fabulous options. Like chicken balls, fish fingers, nuggets, broccoli along with bread sticks, cubes and potatoes. Oh yes, some french fries to dip too! The cheese used was spiced up with some peri peri, so it wasn't bland at all and it was super. So nice, that when I had to find a place to eat the next day, I went back here! 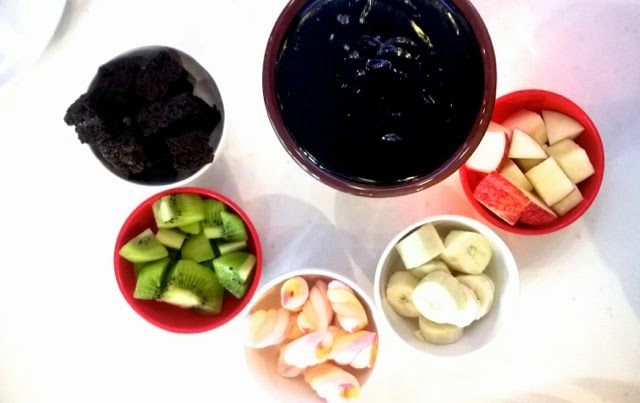 We finished with chocolate fondue! This has been around in Chennai for a while in quite a few places and so this was not really different, but I did like the 60% dark chocolate (that's what he claimed) used. The pricing is a little skewed, because the fondue for two is Rs. 750, while for four it Rs. 850. While you may not get double the quantity, I feel the fondue for two should be priced a little lower (or the fondue for four priced a little higher, he he). Service was friendly, the owner is around most of the times to answer questions and constantly get feedback. The bill the first time was Rs. 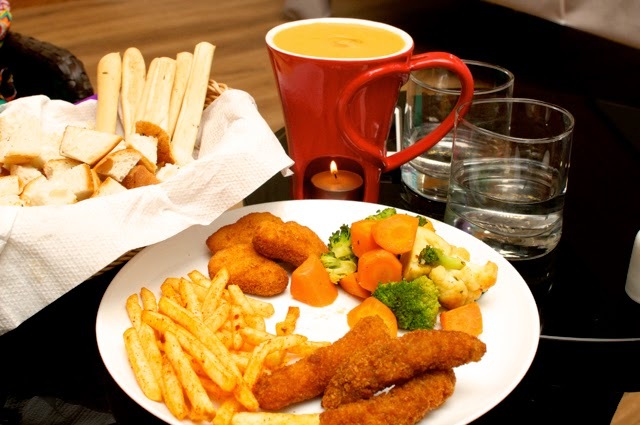 1250 for a chocolate fondue and a non veg cheese fondue with chicken balls, and was Rs. 995 the second time for the same non veg fondue but with fish fingers and nuggets and a pretty ordinary red velvet cake. The second time around, the fish fingers were ok but the nuggets were pretty bad. I do plan to go back and I plan to order only the chicken balls with the fondue!